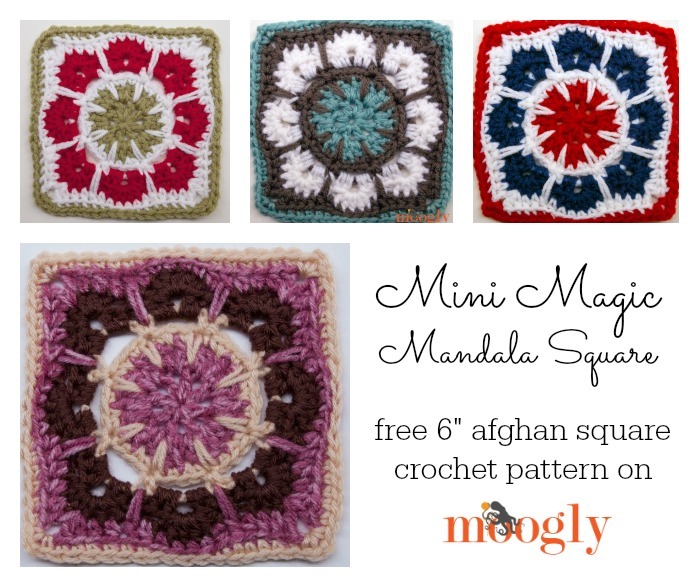 Mini Magic Mandala Square: Free #Crochet Pattern on Moogly! 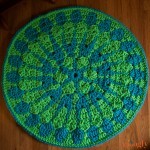 Last year I designed the Magic Spike Mandala, and then turned that into a 12″ afghan square. 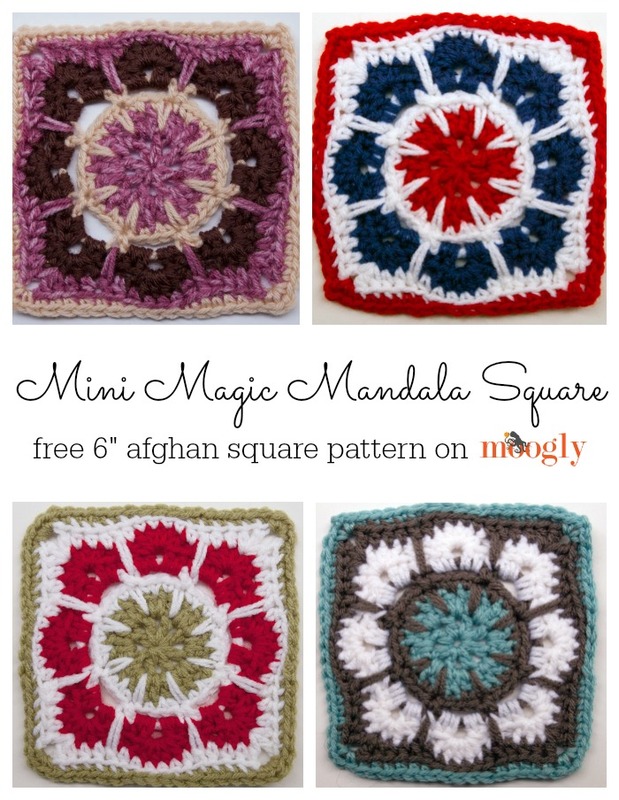 Well, now I’ve reworked that pattern one step further… into the 6″ size Mini Magic Mandala Square! 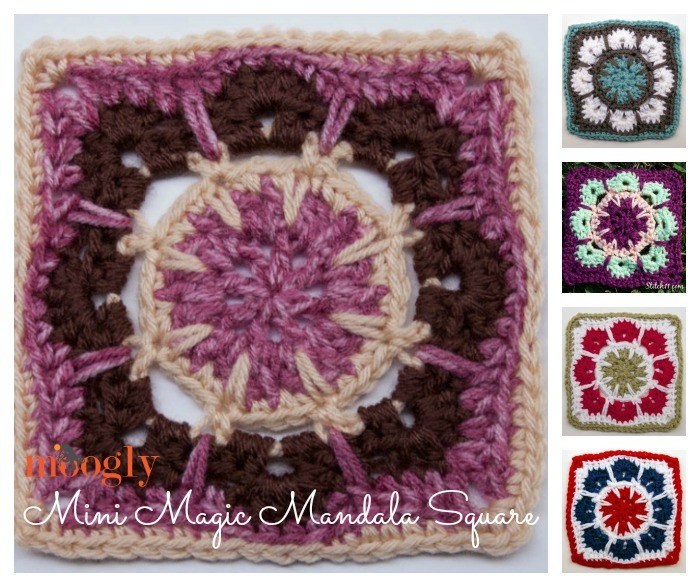 The Mini Magic Mandala Square is super cute mixed with other 6 inch squares, or you could make a gorgeous baby blanket using these alone. Or, you could mix the 6″ and 12″ versions together for a fantastic patchwork design! 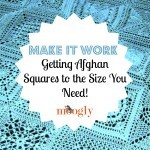 That’s the great thing about afghan squares – you can use them however you want. Even if it’s not in an afghan at all! For additional stitch questions, please refer to the Crochet Abbreviations page or click on the highlighted stitches/techniques below. CLICK HERE for a video tutorial for this pattern! Round 8: With next color, join with sl st to any corner ch-2 sp. *(Sc, ch 2, sc) in ch sp, working in BLO sc in the next 6 sts, sl st loosely in the next 4 sts, sc in the next 6 sts; repeat from * 3 times, break yarn and join. A big Thank You to Corina at Stitch11 for testing this pattern before it’s release! Check out her bright and cheery version below. I love all the different looks you can get with this block depending on how you use the colors – and what colors you use! And that’s all there is to that… for now! Soon I’ll show you one more thing you can do with these squares! So stay tuned! 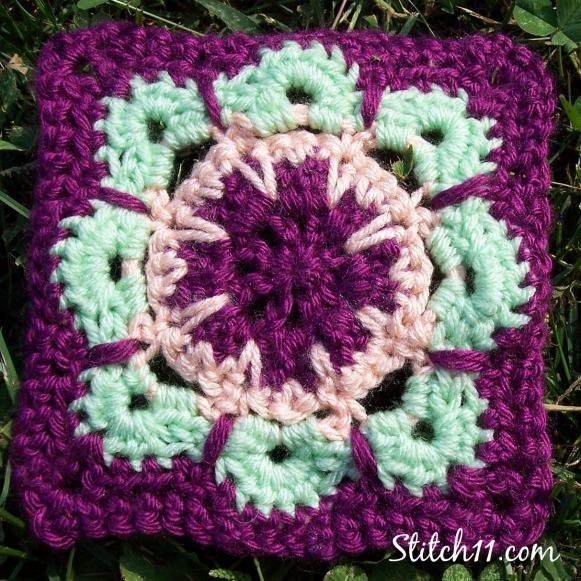 In the meantime, I hope you enjoy this free crochet block pattern! Written pattern copyright Tamara Kelly 2014. Please do not reprint or repost this pattern, but please do link to this page to share this pattern with others. If you wish to make items for sale from this pattern, please visit the About page for details. To print this pattern for personal use, please use the Print Friendly button below – tutorial HERE. 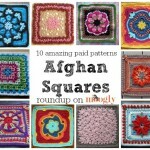 Extra Patterns for the Crochet-a-Long: 10 Paid Afghan Squares! 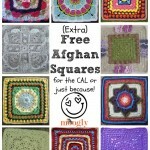 Extra Patterns for the Crochet-a-Long: 10 Free Afghan Squares! These are very cute. I will be putting them on my to do list. I like smaller squares in an afghan, and this one is so pretty! I’ll have to think about colors. Yay for yarn shopping! That blue, white, and gray one is soo attractive! I need to make a blanket with this square, in those colors! Ya! That’s even a great idea! Blanket will look great with this pattern.. CREATIVE MIND! Thanks for posting it thou, it looks amazing! !